Back in the day, Lubach’s (1956-1990) was one of the go-to places in San Diego for your three-martini business lunch. Dark mahogany walls. Red leather booths. Cheerful fireplace. Seafood. Salad bar and grill. Homemade cheesecake. Rinse Cornelis Antonius (“Ray”) Lubach’s restaurant, sadly, is no longer there, but the memories live on. 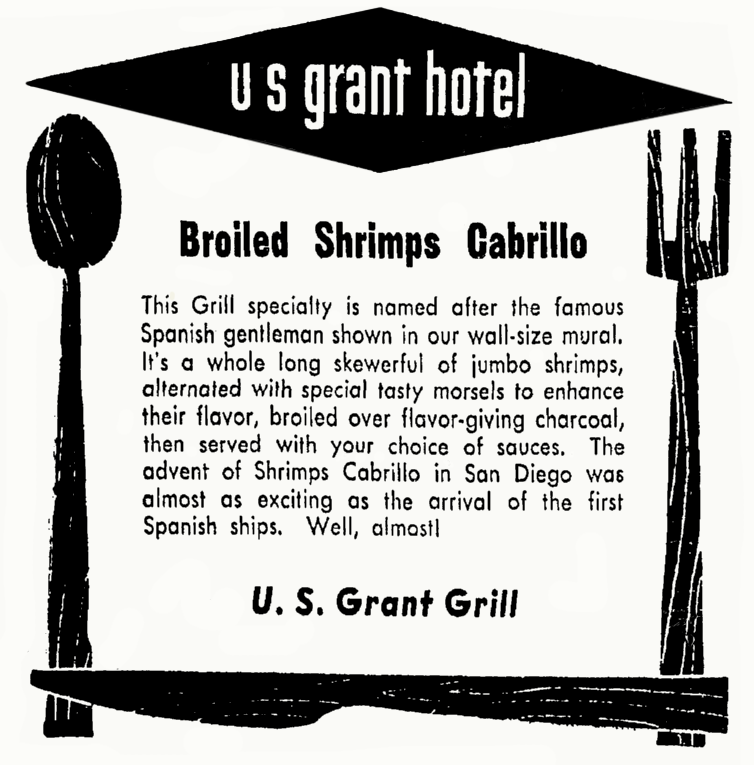 This classic dish was developed by Lubach while he was food and beverage director at the U.S. Grant Hotel. It was a favorite of customers, and for many years the recipe was kept a secret. 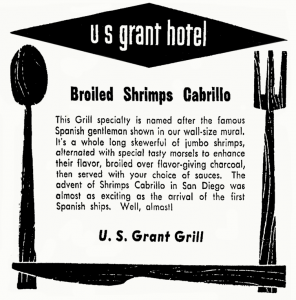 Recipe for Shrimp Cabrillo, grilled brochette with a spicy red sauce, from R.C.A. Lubach’s Restaurant, San Diego, California. This dish was $2.35 when Lubach’s opened in 1956. Peel, clean and de-vein shrimp. Prepare bacon and peppers. Rinse and trim stems from mushroom caps. Rub oil on shrimp. 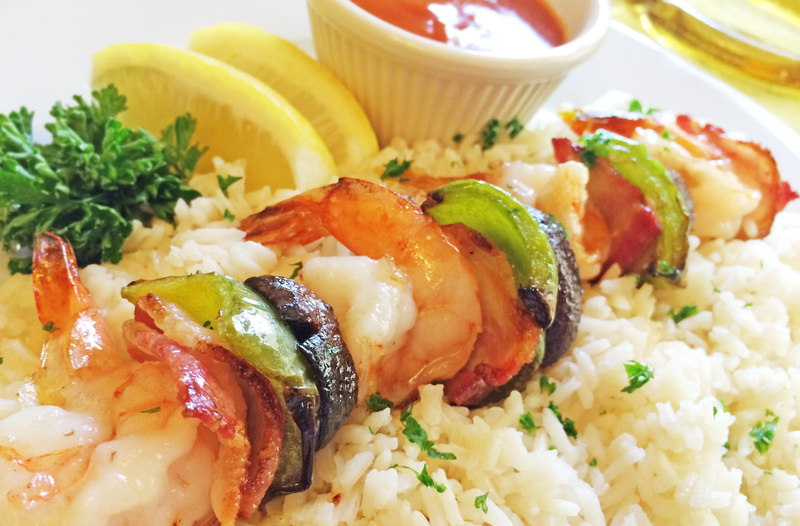 On skewers thread one shrimp, a piece of bacon, a piece of pepper, one mushroom and repeat, ending with a shrimp. This amount of ingredients fills about 6 (standard size) rotisserie skewers. Broil shrimp skewers over charcoal about eight minutes on each side, or 15 minutes on a rotisserie. Shrimp should turn a nice pink, peppers slightly olive and mushrooms brown. Remove from fire. Remove ingredients from skewers to warm pan or platter with melted butter on the bottom, and keep warm. Allow about 4 to 6 shrimp per person and serve with sauce on the side. Garnish plate with parsley and lemon wedges. Steamed rice and a green salad are good accompaniments. June Crosby. June Crosby’s San Diego Fare: An insider’s guide to San Diego area restaurants. La Jolla, California: Crosstown Publications, 1972. So happy to find this recipe. Lubach’s was my father’s favorite restaurant. I have fond memories of it.